By Charles Moffat - 2007. When she was eleven Elisabeth's education was considered complete. To her great delight she then left school for good, and returned to her home, "overjoyed", she writes, "at not having to leave my parents again." The atmosphere of the household was artistic and the child had every opportunity to indulge her natural tastes. The painter Doyen, an intimate friend of her father's, helped her in her efforts to draw, and Davesne, a professor at the Academy of St. Luke, asked to be allowed to give her lessons. The lessons do not seem to have amounted to much, for beyond a few suggestions as to setting her palette Elisabeth was allowed to follow her own devices. These were happy days for the little girl; she spent many hours in her father's studio experimenting to her heart's content with his crayons, and dutifully accompanied her mother, who, we are told, was "good to the point of austerity," to high mass and to evening prayer. She took pride in the cleverness of her brother, three years younger than herself, and assures us with naive frankness that he was much prettier than she. Indeed, at that time ]Elisabeth, from her own account, was far from beautiful; her eyes, she says, were deepset, her face was pale and thin, and, moreover, she was growing so fast that she could not hold herself erect. All this was a trial to her mother, who showed a marked preference for her younger child, whom she spoiled with indulgences, whereas with Elisabeth she was strict and even severe. The father's love and devotion, however, were unremitting, and in return Elisabeth lavished upon him the tenderest affection. Her grief, therefore, was great when, in May, I768, her father died. She was then thirteen years old. "So heartbroken was I," she writes, "that it was long before I felt equal to taking up my pencil again. Doyen used to come to see us sometimes, and as he had been my father's best friend his visits were a comfort. It was he who urged me to resume the occupation I loved, and in which, to tell the truth, I found the only consolation for my grief." In order to distract her daughter's mind from the sorrowful thoughts upon which the girl constantly dwelt, Madame Vigee used to take her to the Luxembourg Palace to see Rubens's works, then in a gallery there, and to various private collections of pictures where specimens of the old masters were exhibited. "As soon as I entered one of these galleries," she writes, "I immediately became just like a bee, so eagerly did I gather in knowledge that would be of use to me in my art, and so intoxicated with bliss was I in studying these works of the great painters." It was at this time that Elisabeth began to paint from nature. Several portraits, in pastels and in oils, were accomplished, and to improve herself she copied some of Rubens's, Rembrandt's, and Van Dyck's pictures, and several heads of young girls by Greuze which she thought offered a good lesson in flesh painting. She was already beginning to be noticeable for the beauty which was one of her charms in after-years, and was even now a source of gratification to her mother, who saw with pride the plain, pale-faced child developing into a fair and blooming young woman. Her progress in art was rapid, she was already talked about to some extent, and her name became known to various painters prominent in that day, among whom was Joseph Vernet. He gave her cordial encouragement and earnestly advised her to follow no school system, but to study only the works of the great Italian and Flemish masters, and, above all, to turn to nature" the first and best of all teachers." This counsel, Elisabeth says, she faithfully followed, and was never indebted to any one master for her instruction. Success came to her very early in life, and at fifteen she was already earning so much money as a portrait-painter that she contributed largely to the support of the family, left penniless at her father's death. But with all her courageous efforts it was difficult to meet the household expenses and to defray the cost of clothing and schooling for her brother, and before very long Madame Vigee, prompted thereto, it may be, by a wish to assist her daughter in her struggles to support the family, decided to marry a rich jeweler, Monsieur Le Sevre by name, who, however, soon proved himself so penurious that his wife and stepchildren found themselves reduced to the bare necessities of life, although Elisabeth handed over to him everything she earned by her brush. Joseph Vernet and other friends, indignant at the manner in which she was thus defrauded, begged her to grant merely an allowance to her parents and to keep the rest of her earnings for herself, but fear lest her mother should be made to suffer for any such action deterred her from adopting this measure. At this time Elisabeth's home in Paris was in the rue Saint Honore opposite the terrace of the Palais Royal, which her windows overlooked. In the garden of the palace she frequently saw the Duchesse de Chartres walking with her ladies in waiting, and before long the young girl discovered that she herself was in her turn, and with the kindliest interest, observed by the duchess, who finally sent for her and asked her to paint her portrait, recommending her also to many of the court ladies, who forthwith visited the studio in the rue Saint Honore and commissioned Elisabeth to paint their portraits. No doubt the youth and beauty of the artist did much towards making her the fashion she now became, and as she was charming in manner as well as fair of face, and was, moreover, gifted with a quick and ready wit, many of the gay young courtiers who became her sitters openly expressed their admiration, somewhat to her annoyance. "It may readily be supposed," she writes, "that some admirers of my face gave me commissions to paint theirs in the fond hope that they might in this way win my good graces; but I was so absorbed in my art that nothing could distract me from it, and as soon as I detected any inclination on the part of the gentlemen who sat for me to make sheep's eyes at me, I used to paint them looking in another direction, and then at the least movement of their pupils towards me I would cry, 'Now I am doing the eyes!' This was, of course, rather trying to them, and my mother, who was always present, used to laugh quietly to herself." These were busy days for the young artist, who found her brush in such demand that she could with difficulty execute the commissions which poured in upon her. On Sundays and saints' days she allowed herself a little rest, and on those occasions, after hearing high mass, she tells how her mother and stepfather would take her to walk in the beautiful gardens of the Palais Royal, where the fashionable world, arrayed in its best, was wont to disport itself, and where her beauty attracted much attention. At that time the opera house was close to the palace, and at half past eight on summer evenings, when the performance was over, every one adjourned to the gardens, where singing and instrumental music were continued until the small hours of the morning. Paris was light-hearted and careless in those years preceding the terrible Revolution of 1789, so soon to break forth in all its horrors, but so little suspected then by the frivolous world of fashion. From the time she was fifteen, Elisabeth was much sought after in the most distinguished society. Princes and dukes showed her marked favor; all the celebrated artists were numbered among her acquaintances, as well as men of letters and those who had attained celebrity on the stage. But none of the social functions at which she was made welcome could induce her to neglect her work; in that her interest continued unabated. In the autumn Of 1774, when she was nineteen, she was elected a member of the Academy of St. Luke. Soon after this she became acquainted with Jean Baptiste Pierre Le Brun, a well-known picture dealer who was looked I upon in that day as one of the first connoisseurs of paintings in Europe. He showed conspicuous attention to the young girl, inviting her to visit his rare collection of works of the old masters, and lending her many of his most precious specimens in order that she might copy them. At the end of six months he asked for her hand in marriage, and Elisabeth, although far from wishing to become his wife, was persuaded after much indecision and many misgivings to accept his offer, led thereto by the urgent desire of her mother, and still more induced by her own longing to escape from the misery of living with her stepfather. "But so little did I feel inclined to sacrifice my liberty," she writes, "that even on the way to church I kept saying to myself: 'Shall I say yes, or shall I say "no"?' Alas," she adds , "I said 'yes,' and thereby merely exchanged present troubles for others. In short, Le Brun, a man many years older than she, although agreeable enough in manner, proved a spendthrift and a dissipated gambler, who, having made way with his own fortune, felt no scruples in spending all the earnings of his young wife, whom he seems to have married in order to obtain an easy means of support. At his request the marriage was for some time kept secret, and many friends of the bride's, unaware that the event had been consummated, took occasion to warn her against a step which they well knew would cause her nothing but unhappiness. Alas, that these warnings should have come too late! Elisabeth Vigee was already Madame Le Brun, and only too soon did she learn for herself that the misery predicted for her by her friends was indeed hers. Fortunately, absorption in her art and a naturally buoyant disposition enabled her to bear her lot. At the desire of her husband that their income should be increased she now consented to give lessons in painting, but this expenditure of her time and strength was so distasteful to her that she soon abandoned it for her beloved portrait painting. "The number of portraits I painted at this time," she says, " was really Prodigious." "Le Brun, the model and the painter of beauty, A modern Rosalba, but more brilliant than she, Unites the voice of Favart with the smile of Venus,"
He turned towards the object of his praise, and at once the audience, including the Duchesse de Chartres and the King of Sweden, rose to their feet, and, turning in her direction, applauded her with enthusiasm, so that she was " almost overcome with confusion." 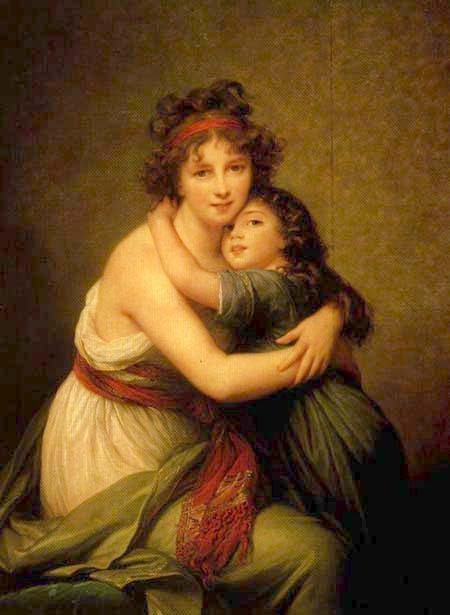 But all these pleasures of gratified vanity were, she assures us, as nothing compared with the joy she felt when in 1780 her child was born - the little girl, Jeanne Julie Louise, whom she has represented in more than one of her pictures clasped in her own loving embrace. In 1779 Madame Vigee Le Brun painted the first of her many portraits of Queen Marie Antoinette, whose favorite painter she became and with whom she was always on a footing of affectionate intimacy. 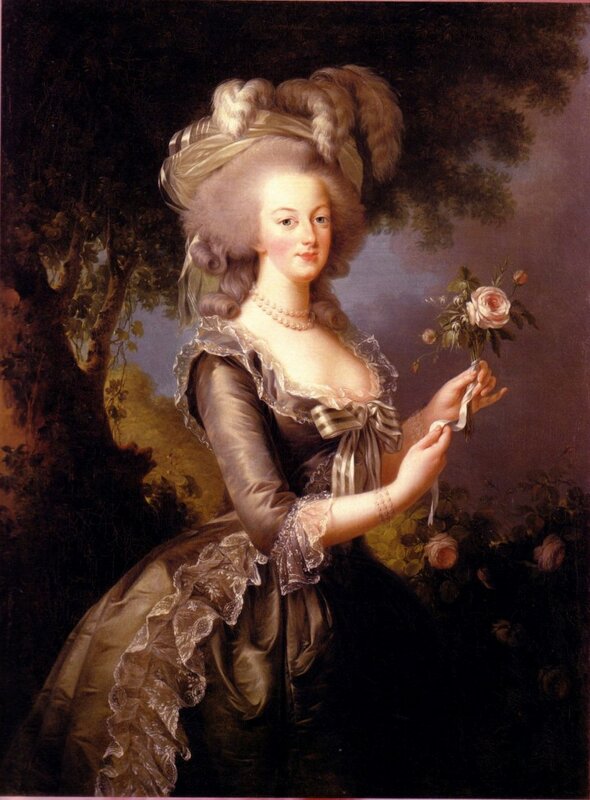 At the first sitting, it is true, the artist was somewhat intimidated by the imposing air of the queen, but this impression was soon dissipated by Marie Antoinette's graciousness, and we are told of the duets that were sung by the royal model and the painter at the close of the morning seance, for the queen dearly loved music and Madame Le Brun had a charming voice. One day illness prevented Madame Le Brun from keeping her appointment at the palace, and when on the following morning she went to Versailles to make her apologies, she was coldly received by one of the chamberlains, who reminded her that the previous day had been that appointed for the sitting, and that as the queen was then about to o out to drive he was sure nothing could be arranged for that day. When admitted to the royal presence, however, she found the queen far more ready than the chamberlain to excuse her remissness. 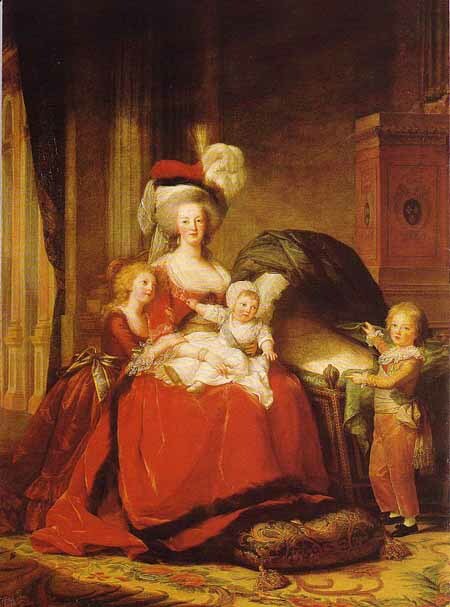 Upon learning that Madame Le Brun had been ill, and had come then only to offer apologies and to receive further commands, she begged the artist not to go, revoked the order for her carriage, and willingly gave Madame Le Brun a sitting. "I remember," says the painter, "that in my confusion, and my eagerness to make a suitable reply to all this kindness, I picked up my paint-box so excitedly that it upset, and all my brushes and crayons were spilled upon the floor! As I stooped to pick them up the queen said, 'Never mind, never mind,' and in spite of anything that I could say, she gathered them all up herself." In addition to her portraits of the queen, Madame Le Brun painted those of all the royal family, with the exception of that of the Comte d'Artois. 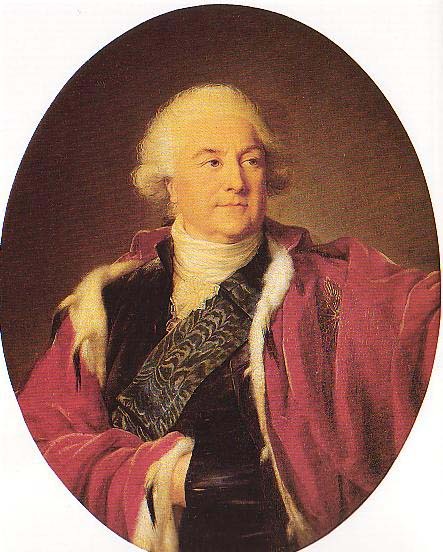 While at work upon the one of "Monsieur," brother of the king and afterwards Louis XVIII, she has told us that the prince, whose conversation was always witty and entertaining, liked to vary the sittings by singing songs which were not so pleasing as his talk, and were rendered less so by a voice by no means true. "How do you think I sing?" he asked one day. "Like a prince, your Highness," was the quick reply. In 1782 Madame Le Brun accompanied her husband upon a business trip into Belgium and Holland. She writes enthusiastically of all that she saw in the way of art in those countries, and was so struck by the beauty of Rubens's picture 'Le chapeau de paille' (The Straw Hat), then in Antwerp, that she at once painted a portrait of herself in a similar style. The picture, which, like its prototype, is now in the National Gallery, London, added considerably to her reputation, and was the occasion, upon her return to Paris, of her being proposed by Joseph Verner as a member of the Royal Academy of Painting. This honor was conferred upon Madame Le Brun in 1783, and for her reception picture she painted 'Peace bringing Plenty' (Plate 10). As a member of the Academy she was now accorded the privilege of exhibiting her works at the Salon, a privilege which in those days belonged exclusively to academicians. Madame Le Brun lived at this time in the rue de Clery , Paris, where her husband occupied large and richly furnished rooms in which he kept his valuable collection of pictures; she herself was relegated to a small anteroom and a simply furnished bedroom which served also for her drawing-room. There she received her numerous visitors, and gave her famous evening parties to which all were so eager to come that the little room was frequently crowded to overflowing; even marshals of France, she says, were obliged to sit on the floor for want of chairs! Great musicians furnished the music on these occasions, and famous actors took part in the impromptu charades given for the entertainment of the guests. At ten o'clock a simple supper was served, and at midnight the company dispersed. On one memorable occasion a repast after the manner of the ancient Greeks was devised, the idea for the entertainment being suggested to the hostess by her brother's reading of 'Anacharsis,' in which a Grecian dinner is minutely described. The cook was at once summoned and instructed how to prepare the viands, the ladies hastily arrayed themselves in Greek costumes, the materials for which were furnished by the studio belongings of Madame Le Brun, similar costumes were improvised for the men, Etruscan pottery was borrowed from one of the guests, hanging lamps were appropriately arranged, and at half past nine all was in readiness to surprise two late comers, the Comte de Vaudreuil and Monsieur Boutin, who upon entering the room found the assembled company grouped around the table singing Gluck's chorus, 'The God of Paphos,' and whose astonishment and enthusiasm knew no bounds. Reports of this novel entertainment spread all over Paris, and accounts of what was denounced as Madame Le Brun's lavish expenditure were grossly exaggerated. Twenty thousand francs, it was said, had been spent upon this famous Greek supper; from twenty thousand the sum grew to forty, then to sixty, and finally to eighty thousand. "In reality," writes Madame Le Brun, "the supper had occasioned an outlay of somewhat less than fifteen francs" (three dollars). It will be seen from this that Madame Le Brun was not without enemies, who, jealous of her beauty and success, not only accused her of extravagance, but circulated reports detrimental to her fame and honor, coupling her name with that of Monsieur de Calonne, the minister of finance, whose portrait she had painted and from whom, they falsely asserted, she sometimes received sums of money large enough to ruin the treasury of France. It was even said that the fine house recently built by Monsieur Le Brun in the rue du Gros Chenet had been paid for by the minister. Such calumnies were deeply distressing to Madame Le Brun. As a matter of fact, her indifference to the luxuries attainable by money was marked. Her dress, she tells us, was of the simplest; except on state occasions she was habitually attired in white muslin or lawn dresses, and as the money she earned was invariably appropriated by her husband, it often transpired that she had no more than six francs which she could call her own. 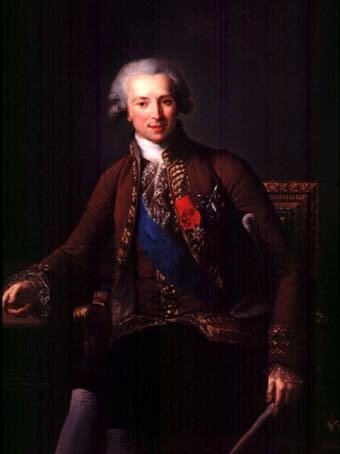 Her 'Souvenirs' record a number of visits which she paid to various chateaux in the neighborhood of Paris, her hosts being the Prince de Conde, the Duc d'Orleans, the Comte de Vaudreuil, the Duc de Nivernais, Madame du Barry, and many other equally noted personages. While staying at Louveciennes, where Madame du Barry lived, unmistakable signs of the approaching Revolution made themselves felt. The news from Paris became more and more alarming, and when Madame Le Brun filled with forebodings, returned to her new home in the rue Gros Chenet she was subjected to repeated insults from the populace, daily becoming more desperate and unruly. Upon the outbreak of the Revolution in 1789, horrified by the deeds of violence enacted daily about her, and terrified for the safety of herself and her child, she resolved to leave France and seek refuge in Italy, where she could pursue her art unmolested. Accordingly, at midnight of the fifth of October of that ill-omened year, having disguised herself in the rough garb of a working woman, she and her little daughter, accompanied by a governess, set off in the public coach, were safely conveyed beyond the French border, and, after passing through Switzerland, arrived in Italy. There the ' journey became almost a triumphal progress; everywhere the artist went the most flattering welcome was accorded her; at Bologna she was elected a member of the Academy of that place, at Florence she was asked to contribute her own portrait to the collection of artists' portraits in the Uffizi Gallery, and at Rome, where she was made a member of the Academy, the academicians presented her with the palette of the young French painter Drouais, who had lately died, and begged that in exchange she would allow them to have some of the brushes with which she was accustomed to work. The most distinguished society of Rome opened its doors to her and the most eminent people made her welcome. At the end of a sojourn of nearly eight months in Rome she went to Naples, where again she was the recipient of marked attentions from people high in favor at court, and where during her six months' stay she painted portraits of members of the royal family and of many well-known people, among them the beautiful Lady Hamilton, whose husband was at that time British ambassador at Naples. After leaving Naples, a short stop was made in Rome before traveling to Perugia, Florence, Siena, Parma, Mantua, and finally to Venice, where she spent some time before going on to Verona, Milan, and Turin. From there she had planned to return to France, but upon learning of the grievous events which had taken place in Paris, and finding Turin filled with French refugees who had been driven from their country, the idea of returning home was relinquished and Vienna was decided upon instead. 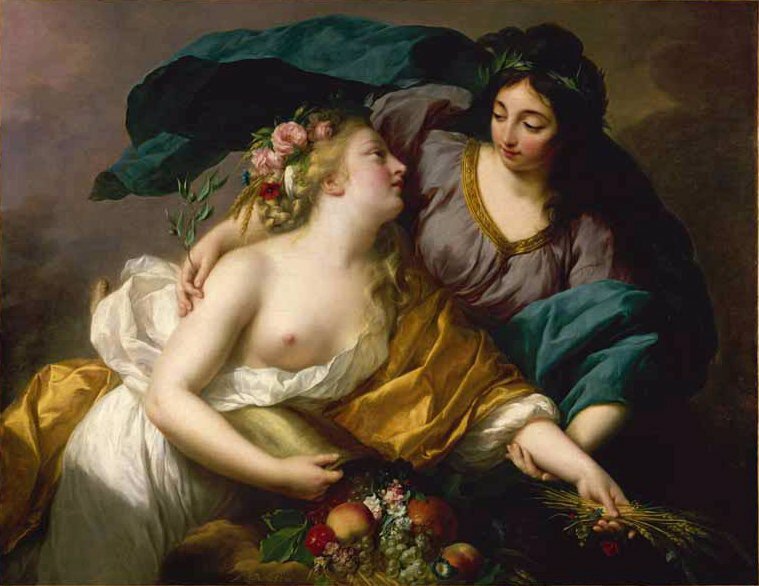 In that city Madame Le Brun passed two years and a half, receiving flattering attention wherever she went, entering into the gay social life of the Austrian capital, and busying herself with her painting. Her stay there was saddened by the news received from Paris of the tragic fate of Louis XVI. and of Marie Antoinette, as well as of many of her friends and acquaintances who had met death on the scaffold. Return to France was now not to be thought of, and, desirous of adding to the fortune she had already acquired during her absence, Madame Le Brun decided to go to Russia, where she had many friends. Passing through Prague, Dresden, and Berlin, she finally reached St. Petersburg towards the end of July, I795. No reception could have been more gratifying than that accorded her upon her arrival in the Russian capital. A call from Count Esterhazy, the French ambassador, preceded her presentation to the Empress Catherine II., who received her with gracious kindness and ever after bestowed upon her marks of favor and regard. Dinners and balls and entertainments of every description in the gay city of St. Petersburg followed each other in quick succession, until one wonders in reading the vivid account given in the 'Souvenirs' how time could have been found for the numerous portraits which Madame Le Brun executed while in Russia. The one she was to have painted of Catherine II. was never accomplished, owing to the death of the Empress in I796, but of the Empress Maria, wife of Catherine's son and successor, Paul I., she painted in the following year a full-length portrait, and innumerable titled people, men and women, sat before her easel. Finally, the honors shown her were crowned by her election as a member of the Academy of Arts. In the midst of her gay and brilliant career in Russia one sorrow darkened her life; that was the marriage of her dearly loved daughter, then seventeen years old. Willful by nature and spoiled by her mother's blind and idolizing affection, the young girl had set her heart upon accepting the offer of marriage made her by a certain Monsieur Nigris, secretary to Count Czernicheff, a man twice her age, and one of whom her mother knew enough to feel convinced that no happiness could accrue from such a union. Her veto, however, was withheld provided Monsieur Le Brun would give his consent, and until such time as a letter from him could be received the daughter wounded her mother by her coldness and suspicions. The marriage finally took place; and to Madame Le Brun's grief, what had seemed to be genuine feeling on the part of the young bride proved a mere passing infatuation, which at the expiration of a fortnight came to an end. 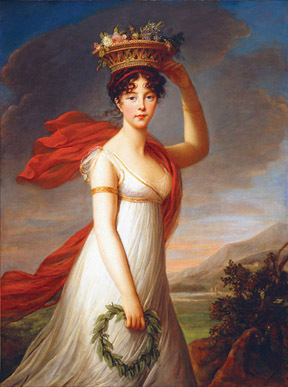 Heart-sick and broken in health by her anxiety, Madame Le Brun resolved to leave St. Petersburg, and in October 1800, she took up her residence in Moscow, where she spent five months. At the end of that period she had grown so sad and ailing that not withstanding the entreaties of her friends and the many orders for portraits, sufficient in number to keep her occupied for many months to come, she made up her mind to return to her own country. Accordingly she journeyed back to St. Petersburg, then in a tumult of excitement over the assassination of the emperor, Paul I., bade adieu to the daughter who was still estranged from her, took leave of her many friends, and, having had a farewell audience of the new emperor, Alexander I., and his empress, who begged her to reconsider and remain in Russia, where they promised that everything possible should be done to restore her health, Madame Le Brun, touched though she was by so much kindness, reluctantly left the land where ,many happy years had been spent. During a short stop in Berlin she met with the utmost consideration from Queen Louise of Prussia, who welcomed her at Potsdam and of whom she made two portraits in pastel. Before her departure from Berlin she was informed by the director of the Academy of Painting there that she had been chosen a member of that body. In the summer of 1800 Madame Le Brun reached Paris, after an absence of twelve years. Her husband still occupied the house in the rue Gros Chenet, and on the occasion of his wife's return, elaborate preparations were there made to receive her. The staircase was lined with flowers, costly hangings of green and gold decorated her bedroom, and a crown of gold stars was placed over the bed. She seems to have been in no way unappreciative of these demonstrations, although she remarks, riot without a touch of bitterness, that she herself was obliged to pay for them with her own earnings. Paris had undergone many changes during these twelve years. Napoleon Bonaparte as First Consul now held sway at the Palace of the Tuileries, and such festivities as were given there seemed to Madame Le Brun dull and conventional compared with those she remembered in the days of the old regime. "The whole city, too," she writes, "presented a far less lively appearance". But for Madame Le Brun herself, pretty and charming as she still was at forty-six, the same gay and social life which she had before enjoyed, and was accustomed to lead wherever she might be, was at once resumed. All who were left of her old friends flocked about her, and on the first occasion of her appearance in a concert-hall where the Parisian world was assembled, every one turned in her direction when she entered and heartily applauded the popular artist, even the musicians rapping on their violins with their bows. The following year Madame Le Brun made a journey to England, a country she had long wished to see. Arrived in London, she was the object of much attention from the prominent people of the day, among them the painter Sir Joshua Reynolds. As usual, her brush was in demand and her working time was quickly filled. Some jealousy seems to have been aroused among the English artists when it was learned that she had been commissioned to paint the Prince of Wales (afterwards George IV). Her stay in England, which had been intended to last but a few months, had continued for nearly three years when news reached her that her daughter had arrived in Paris. She at once returned home, but her joy in again seeing her child seems sadly enough to have been in no way reciprocated by that daughter, who obstinately refused to live with her mother and insisted upon associating with companions whom Madame Le Brun could not admit to her house. Only one more journey of any length is recorded in the 'Souvenirs.' This was to Switzerland in 1808-9, where she painted a number of landscapes, and at Coppet made a portrait of Madame de Stael. It was after her Swiss tour that, "having at length acquired," she says, "an inclination for rest," she purchased a country seat at Louveciennes, near Paris, which became, as her house in Paris had been, the center of a highly cultivated and brilliant circle. Especially was this the case when, after the Napoleonic rule, the Bourbons under Louis XVIII. came once more into power. In 1813 Monsieur Le Brun died an event which seems to have caused his wife genuine grief in spite of the trials to which he had subjected her during their years of married life. "This blow, however," she admits, "was far less than the cruel grief experienced at the death of my daughter. All the wrongdoings of the poor little thing were blotted out," she says; " I saw her as in the days of her childhood as I still see her. Alas! she was so young! Why did she not outlive me ?". This was in 1819. In the following year Madame Le Brun's brother also died, and thus the last of her near ties was severed. She herself lived on until she had grown to be an old woman. To the end she took pleasure in the gay and social side of life, to the end she worked at her beloved art. Her time was divided between her apartment in the rue Saint-Lazare in Paris and her summer home at Louveciennes. Two nieces, Madame de Riviere, the daughter of her brother, and Eugenie Le Brun, afterwards Madame Tripier Le Franc, a niece of Monsieur Le Brun, were devoted in their care of her. 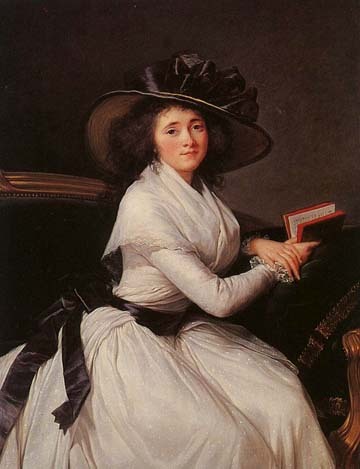 On March 30, I842, Madame Vigee Le Brun died very peacefully, in Paris, at the age of eighty-seven. According to her wish she was buried in the cemetery at Louveciennes. 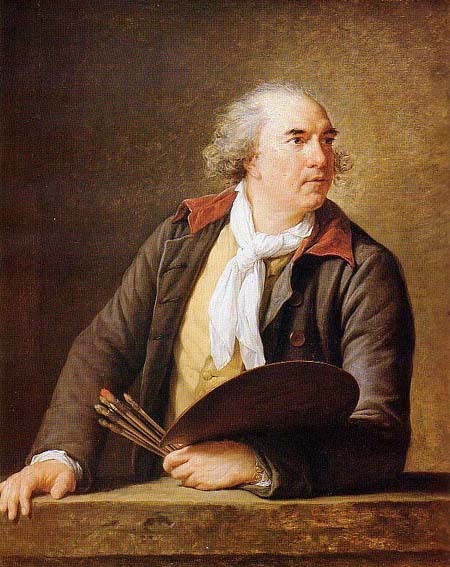 Andre Michel, Jouin's "Chefs D Oeuvre"
In the history of portrait-painting in France there is a period between Nattier and Gerard which may he said to belong to that charming woman Madame Vigee Le Brun. Boucher, who had indeed fallen completely from popular favor, was dead, the nymphs and goddesses of Nattier had taken flight to their faded bowers and desolated groves, and in those last years of what is known us the "old regime " the fashionable world of Paris adopted for its painter Elisabeth Vigee, who had already won fame for herself under that name when, by an unfortunate marriage, she became Madame Le Brun. 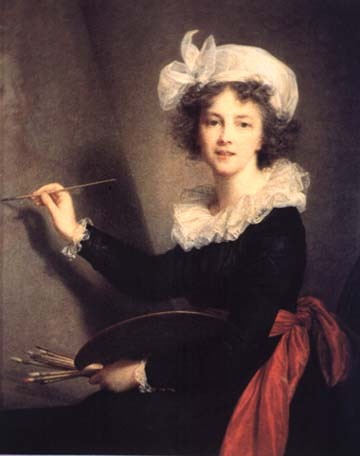 There was so close, so intimate, a connection between this painter and her models that although she lived well into the nineteenth century, dying as recently as I842, she yet remains in the history of French art the portrait-painter par excellence of the court of Marie Antoinette. When, upon the approach of the Revolution, she fled from France, terrified by the first distant rumblings of that reign of terror, it may be said that her work had virtually been accomplished; for her best, her really significant, portraits all belong to her early years. If we would catch in an attitude or in a look the moral reflection, so to speak of an epoch, if we would read the thoughts or divine the dreams harbored under the elaborate head-dresses of the great ladies of that day, or would guess the secrets of those hearts, sometimes full of tenderness, again light and flippant, concealed beneath transparent muslin fichus, it is to the works of Madame Vigee Le Brun that we must turn for answers to our queries. The extraordinary vogue which the painter enjoyed in her lifetime has to some extent continued, so that her fame is distinct and lasting, but it would assuredly be but a doubtful tribute to her memory were her graceful figure to be placed upon any very lofty pedestal, and there made to assume any sort of imperious or magisterial attitude. Moreover, to apply the word "masterpiece" to any work of hers would be to make too free a use of a word the full significance of which has been somewhat weakened by the indiscriminate way in which eloquent chroniclers have applied it. Madame Le Brun would be the first to admonish us not to speak of her in any way but simply, and without undue abuse of superlatives. To the artist herself it was a constant source of regret that because of the overwhelming number of orders for portraits which she received, in a word, by reason of her very success, she was debarred from devoting her talents to great "historical painting." Fortunately for her, however, as well as for us, she remained a portrait painter and a woman. Her aspirations for the "grand style" did not carry her away so far as to do violence to her natural bent, nor to change in any way the limpid purity of her gentle and graceful talent. Full of tender sentiment, as was in accordance with the prevailing taste of the age in which she lived, she yet never descended to silly sentimentality or flat insipidity. " I always tried so far as it lay in my power," she writes in her 'Souvenirs,' "to give to the women whom I painted characteristic attitudes and expressions; those who had no special individuality I painted in nonchalantly pensive positions." In the advice which she gives in regard to the painting of portraits she says: "Before beginning a portrait, engage your model in conversation, try several different poses, and finally select not only the most comfortable and natural, but the one that best suits his or her age and character; for all that helps to make the likeness better. When your sitter is a woman," she naively adds, "you should compliment her; tell her that she is beautiful; that her complexion is lovely, etc. This puts her into a good humor, and enables her to pose for you with more pleasure." The charm and beauty with which in her secret desire to please her models Madame Le Brun invests her pictures is naturally apparent also in her portraits of herself. She was very pretty, and in her old age she used to recall with an amused sort of complacency the days when a crowd would gather round her in the street or at the theater, and when more than one admirer of her beauty would go to her to have his portrait painted, "in the hope of succeeding in pleasing her." Neither in her art nor in her nature was there anything morbid about Madame Le Brun. If we examine the portrait which she has left us of herself and her daughter we shall find something more than light-hearted happiness in her delicate face; beneath and beyond all that there are the marks of courage. Life did not spare her its sorrows-sorrows that were keenly felt. She was as unhappily married as a woman well could be, but she kept intact that treasure of sweet temper and gay spirits which we see in her laughing eyes. All the fairies gathered around the cradle of Elisabeth Vigee as at the birth of a little princess in the kingdom of art. One endowed her with beauty, another with wit; the fairy Grace presented her with a pencil and a palette. It is true that the fairy Marriage, who had not been invited, told her that she was to wed Monsieur Le Brun, the connoisseur in pictures; but to comfort her the fairy Travel promised to guide her from court to court, from academy to academy, from Paris to Rome, to St. Petersburg and to London, with her gaiety, her talents, and her easel before which all the sovereigns of Europe, as well as all those whom genius had crowned, should pose as subjects for her brush. As a painter Madame Vigee Le Brun belongs wholly and distinctly to the eighteenth century; that is to say, to that period in the history of French art which was brought to an abrupt termination by the works of Louis David. So long as she followed the counsels of Joseph Vernet her pencil evinced a certain suppleness and her brush a certain force; but unfortunately she too often sought especially was this the case in her later works - o imitate Greuze, and weakened the likeness to her models by an exaggerated mistiness. She became the fashion so early in her life that she was debarred from any thorough study, and she was too frequently satisfied with a clever suggestiveness in her portraits. 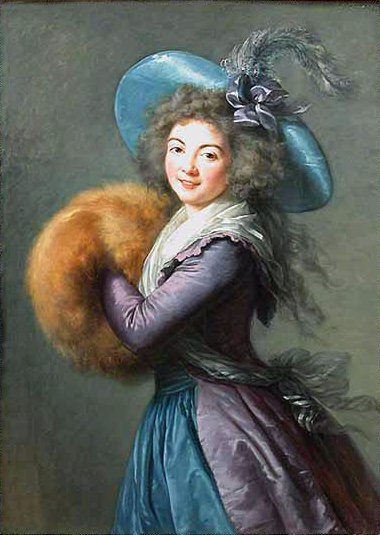 Madame Vigee Le Brun is one of the most charming painters of the French school. In their freshness, their life, and their spirit, her works are unsurpassed; and if they are open to criticism on account of a certain feminine softness and delicacy, the flesh-tones, by way of compensation, are of undeniable excellence. Moreover, in all the accessories of her portraits, to say nothing of the attitudes of her models, her skill was admirable. She possessed, too, one rare quality - a quality characteristic of only true artistsand that is universality; in other words, her portraits do not owe their beauty to the fact that they belong to any one special period, or because they bear the imprint of any definite epoch, but they are and always will be beautiful because of the universal truth they express. Madame Vigee Le Brun painted in the graceful and charming m style of Watteau and of Fragonard, but with greater sobriety and with a note of sincerity that was exceptional in the eighteenth century art of France. She could not, however, wholly escape those mannerisms characteristic of the century which gave her birth, and in some of her portraits we are conscious of a certain artificiality. All her life she vibrated, so to speak, between the method of painting of Jean Baptiste Regnault and that of Jean Baptiste Greuze borrowing from the one his suave and supple touch, his insipid manner of softening, and from the other the exaggerated roundness of his modeling. 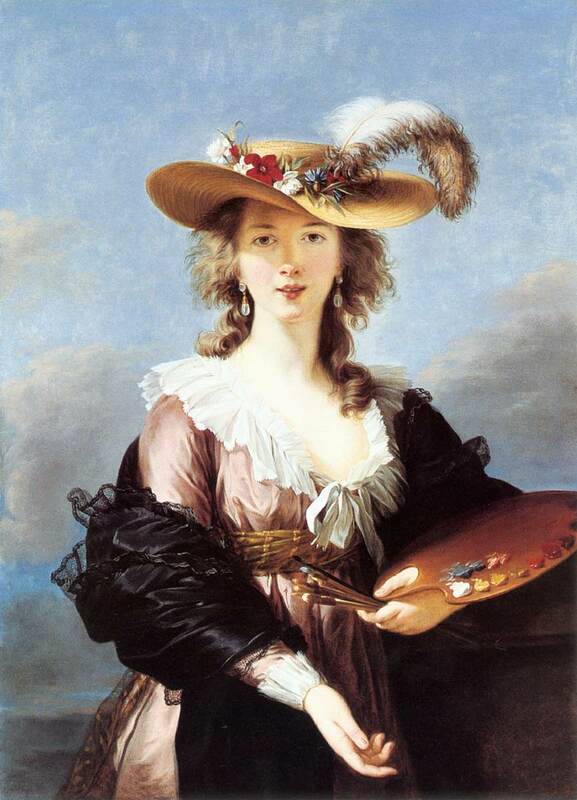 With regard to Madame Vigee Le Brun's position as an artist, there is no doubt that the work left behind her proves her to have been equal to most of her contemporaries, and superior to many. Gros was more dramatic, Louis David had more force and vigor in his touch, and Prud'hon was immeasurably above her in his subject pictures, a line in which Madame Le Brun never shone; but she is vastly superior in technique and bold handling to Hubert Robert or Gerard, and there is an elegance and grace about her portraits which is eminently womanly in the best sense of the word. Still, although her talent was considerable, she owed a great deal of her success to her personality and her industry, for she had the love of work and the perseverance without which even genius is of little use. Madame Le Brun was not a great portraitist; but if not a Velasquez, a Rembrandt, or a Rubens, her work is elegant and refined, and possesses a charm which is not common. "She has neither the force nor the virility of some of the great painters of France," says her biographer, M. Charles Pillet, "but because of the exquisite delicacy of her touch she is one of the most aimable painters of the French school." Aimable that little French word exactly expresses Madame Le Brun's position in the great army of portrait painters.